Summary: Chappell begins by using soybeans as an example of costs outstripping earnings and the need to recognize when to change production practices. 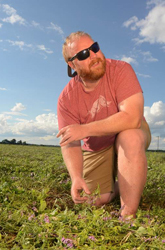 He reviews the benefits of no-till and cover crops, including reduced irrigation, weed control, better stands and planting conditions, nitrogen contributions and nutrient cycling, and adding value with livestock. In his experience, planting cover crops has given him flexibility and made farming fun again.